Allows you to create your own IF THEN statements that will dynamically change the function of a button. This addon is intended for people that have a basic understanding of programming. Specifically conditional If-Then statements. The addon allows you to write your own if-then statements that will be evaluated and run whenever you press a button, or they can trigger on certain events ingame. It provides a simple text editor, a fully documented API and some simple If-Then syntax so that you can string together almost anything you want to react to. Look at the FAQ page for the most asked questions, and the Examples page for examples. OnEvent(UIError) will now trigger properly when inputting a text to match (reported by Louth). HaveTalent() will no longer cause lua error when PvP argument is omitted (reported by Spodi2290). The morehelp window has been redesigned. This is due to UI-changes in patch 7.1 by Blizzard. HasBuff() now has an optional OP argument. Added a shorthand alias to the PlayAudio() function: "Headless". Report(), PlayerHasMoved() has updated documentation. %playerCoordinates%, %playerLocation% has updated documentation. HasBuff() will now also work with capitalized or uppercase input. HasBuff() will now return true if your target has an buff/debuff/aura/ability on them with the specified name. It will not consider the harmful/helpful nature of it (reported by yoloswaggger). Report() no longer support "debuff" argument. Use "buff" instead. HasDeBuff() is merged with HasBuff(). Fixed some typos in the documentaion. Methods:getNPCNameFromGUID() will no longer print diagnostic info. Craft() allows you to craft an item (request by TaraNTino). IfThen macro will now update its icon properly. Improved clicking a quest/achievement in the objectives tracker while the edit window is open to copy it's name. LibDataBroker integration updated to show tooltiptext and use textureID's instead of texture-strings. IfThen macro will now update its icon properly when using Toybox items. This is a workaround for a Blizzard bug. InWorgenForm() works again. You can now also get a result when targeting NPC's. Removed support for Voice Encounter Mods (VEM). Removed support for glyph links. You can now click on a quest/achievement in the objectives tracker while the edit window is open to copy it's name. IsCurrentSpec() replaces IsCurrentTalentSpec() that has been removed. EnableSpec() replaces EnableTalentSpec() that has been removed. Print() and RaidMessage() now supports 'DemonHunter' as a color argument. IsClass() added 'Demonhunter' as an input argument. HasPower() rewritten and merged with HavePowerpoints(). HaveTalent() added an optional PvP-agument to check for Honor talents. Removed "health" and "power" options. %playerpowertype%, %targetpowertype%, %focuspowertype%, %petpowertype% should now support powertypes for all classes. HaveGlyph() since glyphs are no longer in game. IsCurrentTalentSpec() is removed. Use IsCurrentSpec() instead. EnableTalentSpec() is removed. Use EnableSpec() instead. HavePowerPoints() is removed use HasPower() instead. Print(), Message() and RaidMessage() will now show raid marker icons instead of text strings. ClickActionBar() now works as it should with "Extra" as input argument. Updated to support changes in Battle.net's infrastructure. Removed CHAT_MSG_BN_CONVERSATION since support for conversations has been removed. Reputation lookup should no longer output debug strings in chat. InWorgenForm() returns true/false if you are a worgen (race) thats currently in worgen-form (request by rui). Reputation lookup for Bodyguards/Friends should work again. %InstanceDifficulty% now works with the new Timewalking and Mythic dungeon difficulty settings. Screenshot() function is now working again. Syntaxcoloring should now close windows when toggeled on/off. HavePowerPoint() now supports combo-points for Druids in Feral spec (code provided by mcbobbo). SetSound() Enable/Disable all sound, effects or music ingame (request by baldricinoz). IsMuted() input argument 'both' removed. Now support 'all' so it's consistent with SetSound(). Will no longer output debug info from LFG_LIST_APPLICATION_STATUS_UPDATED. The edit and morehelp window will no longer hide behind other windows just by mousing over another frame. Will no longer cause taint-error from the Blizzard_SocialUI. Keybindings are now found under the "Addons" category instead of "Other". LFGInvite will now also trigger on invitations from the Premade groups tool. PlayAudio() added a few sounds like Hans'gars "I'll be back". Report() will now query the server for the latest savedinstance info before outputting data. InLFGQueue() does no longer support 'lfr' and 'flex' as input arguments since these are no longer ingame. Report() does no longer support the "pvpgear" option. PlayAudio() All shorthand aliases for soundfiles are now working again (pointed to .wav instead of .ogg). IsQuestCompleted() will no longer crash. Many internal Blizzard functions have got their return values changed from 0/1/nil into true/false. Shift clicking a quest in the questlog or objectives tracker is removed. It will no longer paste the questname into the text editor. HaveCritter() will now return true only if a critter is summoned. IsFlyableArea() - Even though the function can return true. You as a player might not be able to fly in the area. That is dependent on your flying skill ability among other things. %InstanceDifficulty% now also returns "Mythic" as a possible value. %PlayerMark%, %TargetMark%, %FocusMark% and %PetMark% will now appear correct in chat with non-english clients. %GuildLevel% has been removed since guild levels are no more. HasTempWeaponEnchant() should now work for offhand enchants. The text-cursor should no longer jump around if you type non-english charaters (like ü, ë and so on) while Syntaxcoloring is enabled (reported by chamann81). Fixed error when OnEvent's were disabled. The events Chat(), GroupInvite() and RoleCheck() will not require their "Player" argument to be written in the "Playername-Servername" format to be correctly matched. "Playername" is enough. Messages about "Deadly Boss Mods" not loaded at login/reload should no longer appear if you have the addon installed, but disabled. Fixed error regarding DBM's SetMainBossID() function after doing a /reload while inside a raid instance. %BossName% should no longer sometimes return the string 'worldboss'. DBMPull() - Start a DBM pull-timer. IsClassified() - Lets you check the classification of a unit (worldboss, rare, elite etc). ClickActionBar() - The code will now try to use the icon for the specified button instead of the default IfThen icon. IsBoss() - Argument is now optional. Will now also check unitname against the enounter journal and DBM like %BossName% does. %BossName% - The name of the boss you are currently in combat with (request by 0xygen). %DeathName%, %DeathSpell%, %DeathAmount%, %DeathOverkill% - The name, ability and amount of damage that last killed the player (request by 0xygen). Report() now reacts to the "all" keyword as before when asking about saved instances. Some of the changes will only be visible when running version 5.4.x of WoW. Report() - Added a "world" argument for the "savedinstance" option. This will list all world-bosses you have killed. InLFGQueue() - Added "flex" as an argument. Added a few more shorthand aliases to the PlayAudio() function. "Ding", "Heads roll", "Not prepared", "Bonestorm", "You fail". %InstanceDifficulty% can now also return "Heroic Scenario" and "Flexible". %InstanceDifficulty% should now return the correct difficulty (Normal/Heroic) for your current instance. Fixed various "See also" links in documentation that should now point to the correct page. Changes made to Documentation & Parsing that should reduce memory footprint of the addon (about 3KB less). Merged some identical event-handlers to reduce memory footprint even more. Rewritten event handlers to no longer wrap arguments into tables. This should reduce memory consumed at runtime. Removed the "PlayAudio" window. This feature is now embedded in the documentation page for PlayAudio(). The documentation page of PlayAudio() will now list all shorthand aliases with clickable links to play the sounds. Addon will no longer trigger errors due to tainting Blizzards UIDropDownMenu (reported by Caraxe). Added "DuelStart" and "DuelEnd" that is triggered when a duel is requested or finished (requested by Camocanine). %StatUniquePets% -Number of unique pets your character has. Fixed bug in getEquippedItems() that caused a LUA error when calling related functions (like Report() %itemlevel% and so on) when zoning into instances. Updated the text for the events "Casted" and "Casting". There is no change in the underlying events just a clarification in the documentation. "Casted" will trigger on the start of (and sometimes during) channeled spells, and at the end of non-channeled spells. "Casting" will trigger on the start of non-channeled spells. HaveCooldown() should be less prone to return true for spells because of the global cooldown. Search-results in the edit window are now clickable. You will then be taken to the documentation page for the function or variable you selected. You can now click on a function listed under the "See also" section of the documentation to jump directly to that function. Parser errors are now clickable. It will take you directly to the page and line number in question. Parser will now output page and linenumber for lines that fail to parse properly. The parser will also output all errors under a single error-header. Added a new 'LineNumber' feature. When enabled it will show linenumbers in the editor. 'Search & Highlight' now displays number of matches found in a better positioned label. Parsing of the raw text will now be suspended until after combat ends. This is to prevent "Script ran too long"-errors with large volumes of text. Addon now supports resolving battlepets-hyperlinks like [battlepet:Cinder Kitten]. 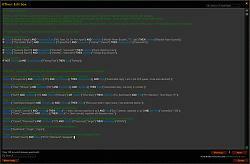 RaidMessage() -Function will now only color the string you input and not the whole RaidMessageFrame. Report() -Friendship reputations will now output the localized name for the current rank. "Chat" event now also supports "system" to trigger on system messages (requested by Delvai). Internal tooltip scanning code will now cache its results for faster lookup of items. Report() will now calculate the correct itemlevel if you only got offhand equipped or 2 weapons. When resolving achievement-hyperlinks the addon will now also try to lookup the achievement using the name specified and not just the ID. When resolving currency-hyperlinks, the addon will first try any ID specifed before using the name. When resolving talent/glyph-hyperlinks, the addon will look in the list of your characters talents/glyphs. Syntaxcoloring will no longer color strings inside quotes as functions. For example RawMacro("/run IFT() /say hello world"). Parser will now accept If-Statements with multiple spaces between keywords (THEN, OR, NOT, AND) even when the keywords are in lowercase. %Itemlevel%, %ItemlevelTotal% and Report() will now calculate the correct itemlevel numbers even with items that are transmorgified or upgraded (credit to Phanx for pointing me in the direction of a solution). Added a new searchbox to search and highlight text in the Edit window. The battleground channel (/bg, /battleground) has been removed from the game. All functions that supported this like Chat(), Report() etc no longer does so. Added "LostControl" that is triggered when you lose control of your character due to interrupts, root etc. HaveLostControl() -Will return true/false if you currently have lost control of your character. InInstanceGroup() -Will return true/false if you are in an instance group (i.e. /instance). InGroup() -Will now also check if you are in an instancegroup (/instance). Group() -Will now send chat messages to /instance if you are in an instance group. Chat() -Now supports "Instance" as channel argument. Report() -Updated how friendship reputation and rank is calculated due to changes in the Blizzard API. HavePowerPoints() -Blizzard renamed a variable used with the Monk Chi from SPELL_POWER_LIGHT_FORCE to SPELL_POWER_CHI. %StatPets% will now output the number of pets as reported in your petjournal instead of from the statistics-page. %instancedifficulty% will now return "Scenario" instead of "Normal" when you are in a scenario. Reworked the code that periodically invokes garbage collection. This will hopefully reduce the occurence of "script ran too long" errors. 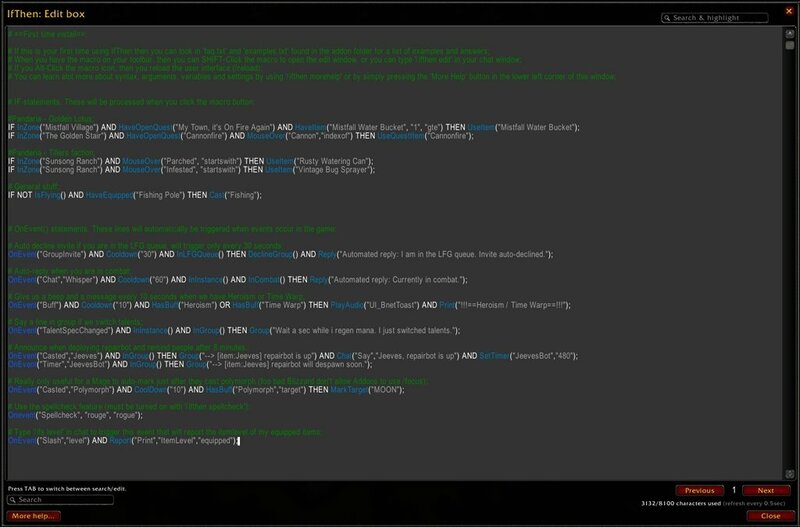 Added a few more lines in examples.txt for use with daily quests in Pandaria. CancelAura() -The function no longer uses the macro to cancel auras/buffs. It will therefore be possible to combine CancelAura() with UseItem() or Cast() in a single if-statement (credit to Doskious). Report() -The 'experience' option will now round outputted numbers and use a a 'K/M' notation. The following variables will now will now round outputted numbers and use a a 'K/M' notation. Their internal datatype has also been changed from 'number' to 'string'. ToggleRaidDisplay() -This function will not work when you are in combat because the Raidframe UI is then marked as protected by Blizzard (credit to Henrick). Added a new 'EasyCast' feature. 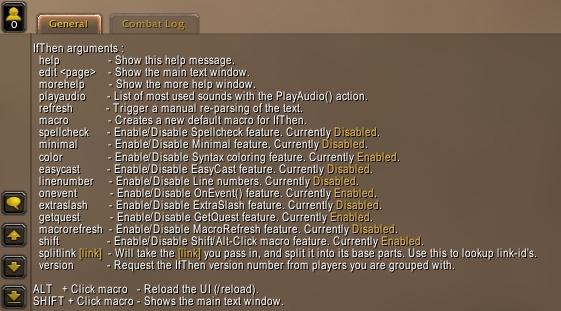 When enabled it will trigger the default IfThen-macro when you are out of combat and do a double right-click. You can now shift-click on items/quests/achievements while the edit window is open and it will insert the link-title (just like auctionhouse search). 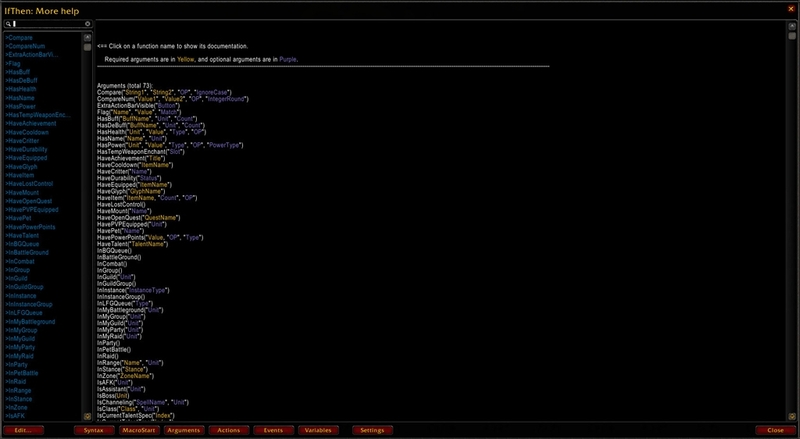 Added several lines in examples.txt for use with daily quests in Pandaria. UseQuestItem() -Argument is now optional. Will use the first found questitem from tracked list if omitted. IsTargeted() -Added a optional 'match' argument to allow partial matches on names. %MouseOverName% -Name of the npc/player/item currently moused over. InRange() can now be found when using the searchboxes. GetQuest feature will now complete quests that only have 1 quest reward as expected. Report() will no longer crash and will properly output friendship reputations. InInstance() now supports 'scenario' as an argument. %InstanceDifficulty%, and %InstanceType% will now return 'Scenarios' or 'Challenge mode'. Added a new 'Color' feature. When enabled it will apply syntax coloring to the editor and examples in documentation. With the introduction of syntax coloring, several of the colors used in the documentation have been changed to better match this new feature. Required arguments are now yellow and optional arguments are purple (formerly blue and yellow). Fixed values are now teal (formerly green). The variables section in the morehelp window now uses a separate color to differ it from the arguments, actions and events sections. IfThen will now display a error message if your macro-list is full (credit to 'rwthomas111' for this one). You can now separate IF-statements to run under different macros. Use the new MacroStart() and MacroEnd() functions (idea by balzakbr). See the new 'MacroStart' section in '/ifthen morehelp' for more info. Added a searchbox to the Edit window. You can press TAB to jump between searching and editing. Added a searchbox to the Morehelp window. Added a new 'Minimal' feature. When enabled it will remove almost all the documentation from memory to reduce the addons footprint (about 20KB smaller). Parser will now only print the first few possible values for an argument when it failes. This way you won't get insanely long error messages. Updated FAQ with more questions and answers regarding macros and combat. Updated Examples with renamed function names. Running both Countdown() and StopWatchStart() at the same time will no longer yield strange results. HaveCritter() and HaveMount() functions are now working properly. Report() now support 'experience' as a type to output your current level and points needed for the next. SetFlag() and Flag() -You can set and check the value of your own internal variables with these functions. Added "Achievement" event that is triggered when you earn an achievement. %InstanceDifficulty% now returns 'Raid Finder' when you are in Dragon Soul LFR. %WatchedFactionName% -Name of the faction shown on the experience bar. RawMacro() now lets you specify a optional MacroName argument to let you write to other macros (idea from balzakbr). Added "PVP" event that is triggered when your pvp-flag is changed. "AfkOrDnd" event is now only triggered when the player is Afk or Dnd and not other events. Warlocks no longer need to specify a type (Shard/Demonic/Ember). The code now infer this from your current spec. For all other classes and specs that dont have a secondary powertype (Holy Priest and Mages for example) the function will return false. All windows can now be moved around by dragging the top of the window. Removed all references to the 'Debug' option. Examples.txt now got a few examples for Rogues. Updated FAQ with more questions and answers. Addon should now start up about 1 millisecond faster on average. Added local pointers for global functions. This should reduce time used on global lookups while running. MacroRefresh feature now uses the new RegisterUnitEvent() to reduce overhead. Macro will now properly reset to doing nothing if your current executing line dont touch the macro. HavePowerPoints() -Lets you check your character's combo-points/chi/balance/rune/holy power/soul-shards/burning-embers (added after request by Pekesino). RawMacro() -Let you output the full raw text to put in the IfThen-Macro (added after request by NeerDeth). IfThen now add launcher shortcuts for the 'Edit' and 'MoreHelp' windows for databroker compatible addons like TitanPanel, ChocolateBar, Bazooka and so on. You can now configure IfThen through a new interface panel (Game menu -> Interface -> AddOns tab). It has the same effect as using the slash commands (/ifthen or /ift). Switched to using a new button template. The buttons should now look a bit better. Report() now returns the proper masculine/feminine form for reputation titles depending on your characters gender (%Report% variables). Added support for friendship titles (basically single-Npc factions). 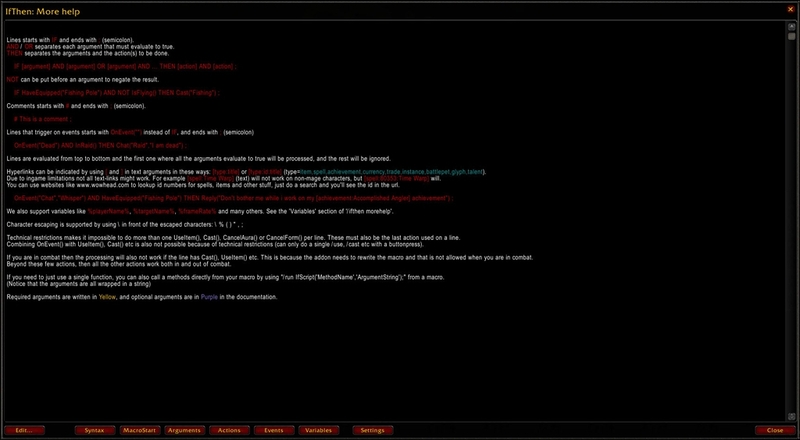 Updated IfThen to work with Mists of Pandaria (MOP) expansion. Many of the game's internal events and functions have been altered, removed or new ones have been added by Blizzard. Some of the changes will only be visible when running version 5.0.x of WoW (The MOP Beta). The .TOC interface number is still that of 4.3.3 to prevent 'Load out of date addons' issues for users on live servers. Added support for the Pandaren monk class. Class color, etc. Things like %GuildLevel% (0-25) and %PlayerLevel% (1-85) will auto-adjust (0-30 & 1-90) when running version 5.0.x of the game. Updated examples.txt with the correct function name "HavePVPEquipped()"
The addon will now check and close the existing edit/help window if its open before opening the other window when using slash commands instead of the buttons. Removed hardcoded internal lists used for currencies and factions. It will now use a search-and-cache approach that seems to give the same performance. HavePVPEquipped() is now aware of the new "PvP Power" stat that is introduced with MOP. InLFGQueue() (in WoW 5.0.x) now has an optional 'Type' argument that lets you filter what queue you want to check for (Dungeon finder, Raid finder, Pet-Battles etc). IsChanneling() now supports a new, optional Unit-argument that can be 'target', 'focus' or 'player' (default). InStance() will now work properly with localized versions of the game. However it now requires you to type the exact, localized name of the stance: "Bear Form", "Bärengestalt", and so on. %PlayerFaction%, %TargetFaction% and %FocusFaction% can return 'Neutral' in some cases in addition to 'Alliance' and 'Horde' (like when you are a level 1 Pandaren). %EquipmentRanged% will disappear when running version 5.0 of the game since the ranged/relic slot no longer exists. Added "PetBattleStart" and "PetBattleEnd" events that will trigger on the start and finish of pet-battles introduced with MOP. "LFGInvite" event now also triggers when queued for pet-battles. Chat() will no longer fail when using 'Emote' as an channel-argument. IsMuted() will now properly default to using the 'both' argument if nothing is inputted instead of crashing. "SpellCheck" is now working as intended. Remember "/ifthen spellcheck" to enable. "ItemUnEquipped" event should now trigger correctly. Parser will no longer crash if you only have "ItemEquipped" events but no "ItemUnEquipped" in your raw text. Fixed a bug that caused the parser to not run "ItemEquipped" events if you also didn't have any "ItemUnEquipped" events in your raw text. HasBuff() and HasDeBuff() will now work even if the stackcount returned by the game is 0 (?!). Using "/ifthen onevent" to disable OnEvent()-statements will now properly unregister all of its background events (like those used by chat). After having played World of Warcraft since its beginning, and developed this addon since 2011 I have lost interest in the game. This addon will therefore no longer be maintained. If any other addon author is interested in taking over development then send me a private message. Last edited by EvilMaddness : 12-30-15 at 05:08 AM. I like the idea, but "Interact with target" is something that you can't do via an addon. It must come from a mouse left/right click. (HW enabled event). -Each time the addon is loaded it says: Type "/ifthen" for more info. -There is an examples.txt included with examples. -There is also an faq.txt. -There is a whole "more help" section included with the editor that documents the whole set of functions and variables. Is it possible to make a button using your addon that will check arena targets 1/2/3 for a healer role and always focus one? You can't automatically change target ingame. You have to manually target a player, furthermore what constitutes an opponents "role" in arena? Is he always a healer if he/she's a priest e.g? You cant determine an opponents role via the "SetRole" system that is used for raids (i assume). I should say that I have only tested this alone (without the InGroup() part) and in party with somebody's alt (who was logged out) - so the extra triggers do not come from their gaining buffs. I already tried putting in Cooldown("10") but what happened was that the message would be sent too late - several seconds after gaining the buff which would then also delay the message that I'm now taking extra damage. Cooldown("10") will return TRUE the first time its executed and then FALSE for the next 10 seconds. Your placing of the statement inside the line just before Chat() will make sure that the rest of the statement wont been executed again. The Buff event will be triggered for alot of stuff ingame, when you gain buffs, area buffs, debuffs, procs of your items, etc, etc so thats probably whats happening. You might also look into using OnEvent("Casted", "Dark Bargain", "player") instead of OnEvent("Buff") since that triggers specificly after a spell is casted. Can someone help me make this work, please? I want to make a OnEvent code that lets healers know that I'm delaying damage with Dark Bargain, and 8 seconds later that I now require healing. It works, but not correctly: Instead of just 1 message, the first part goes off 2, 3 or even 4 times. The timer part goes off once as expected. I tried putting in a Cooldown("10") but that delayed both the first and the second message. I also tried adding HaveCooldown("Dark Bargain") but then it didn't do anything at all. Last edited by CoeurDeLapin : 12-12-12 at 04:14 PM. Anyone know if it would be possible with this addon to make a macro to automatically change a castsequence depending on current eclipse state (for balance druids)? Take a look at HavePowerPoints() to determine what you currently are and use RawMacro() to edit a macro's content other than the default one. Remember; macros cant be edited when in combat.